Slice the onion, carrots and beans. Break the cauliflower into florets. Skin and chop the tomatoes. Heat the oil in a large pan and fry the onion and carrots for a few minutes. Add the tomatoes, stock, tomato purée, 1 teaspoon of the herbs and salt and pepper to taste. Bring to the boil, cover and reduce the heat to a simmer and cook for 15 minutes. Add the cauliflower, beans and peas and cook for a further 15 minutes. Whilst cooking, make the dumplings. Sift the flour into a bowl, add the suet, ½ a teaspoon of mixed herbs and 1 oz (28 g) of the grated cheese. Add salt and pepper to taste. Stir in 4 tablespoons water and mix to an elastic dough. Turn onto a floured surface and, with floured hands, shape into 8 balls. Put the dumplings on top of the vegetables, sprinkle with the remaining cheese, cover and simmer for 30 minutes. 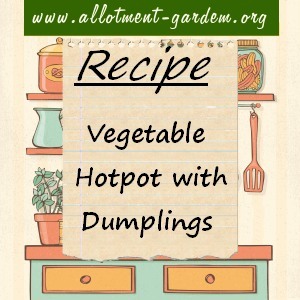 This Vegetable Hotpot with Dumplings Recipe Serves 4. A couple of tablespoons of unsalted peanuts added at the same time as the cauliflower etc. works well.